Boogie Woogie Wednesdays continue every week in November and December at the OS2 Pub from 7 to 9 pm. Closed on Christmas Day. The final Second Saturday Concert of 2013 is Nov. 9 on Telegraph Stage. 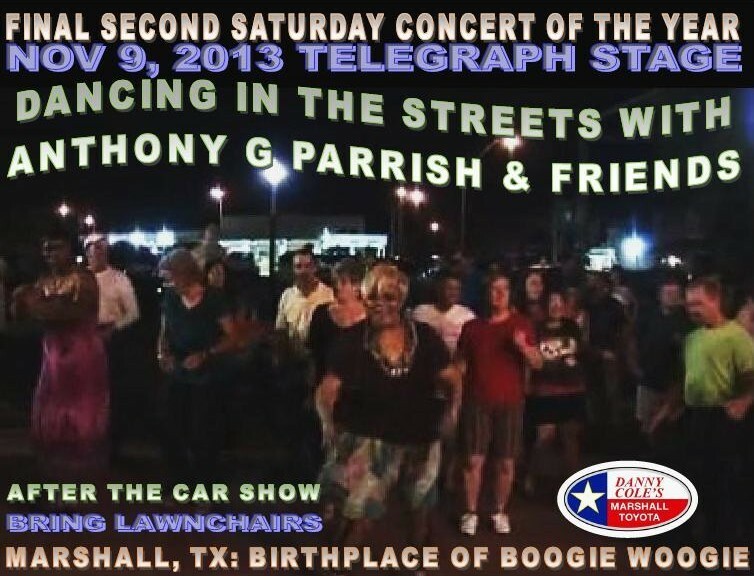 Dancing in the streets with Anthony G. Parrish & Friends, Marshall’s favorite R&B dance band. The free concert starts around 8, after the Marshall Main Street car show. It is sponsored by Danny Cole’s Marshall Toyota. Anthony and his band will also perform at a formal affair at the Marshall Convention Center Dec. 14. Dinner and dancing for $30 per ticket. Always a lovely event and a scholarship fundraiser. We’ll be presenting live music Friday nights during the holidays at a new restaurant, Sweet Sabine’s in Downtown Marshall. It’s on the Historic Courthouse Square, right across from the ice skating rink. Enjoy the performers from 7 pm to 9 pm. Jazz Brunch at Sweet Sabine’s on Sunday, Nov. 17. Pianist Mack Guice will perform.